The Writers’ Guild is a jazz composers’ collective featuring five of Edmonton’s finest creative minds. The band uses the canvas of a traditional jazz quintet, blending musical influences old and new as they continually hone their craft into exciting, vital new music. Each composer in the collective has a unique writing style: Dan Davis’ compositions show a blend of traditional and modern jazz sounds, with catchy melodies over a backdrop of chords which would be right at home in Chris Potter’s latest release. Tyson Kerr’s music, influenced by prominent voices in the Toronto music scene such as Andrew Downing and David Braid, feel at times like vignettes from film and musical scores. Brett Hansen’s style soars across genres and moods, finding just the right moment for a Bill Frisell musing or a full-on grunge rock explosion. Jamie Cooper’s writing celebrates the contributions of greats like Roy Hargrove and J Dilla, bringing neo soul and hip hop to jazz. Rounding out the band is one of the strongest rhythm players in Canada: bassist Josh McHan is the rock-solid foundation holding up all these diverse voices and styles. The Writers’ Guild’s debut album “Based on a True Story” (Chronograph Records) reached #1 on the Earshot! 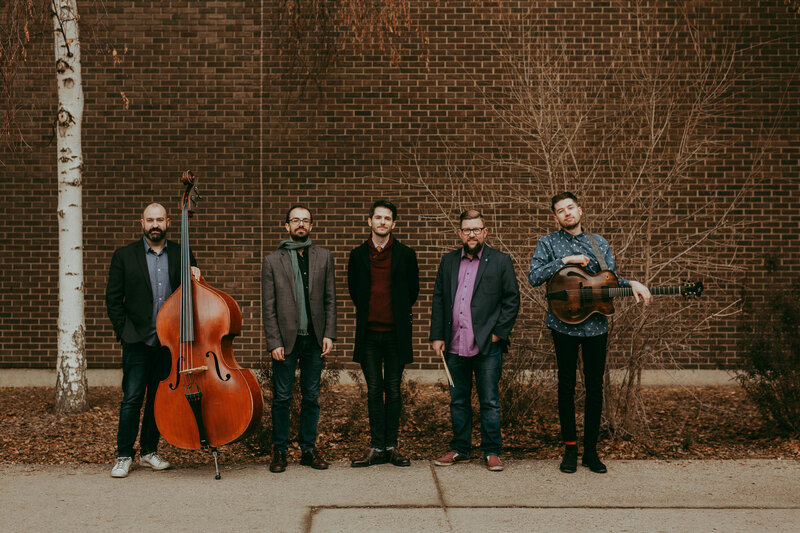 National Jazz charts , and was nominated for a Western Canadian Music Award; they are currently developing compositions for their second studio album. As these composers comment, collaborate, and create each other’s music in realtime, the Writers’ Guild makes ink on paper fly.